Complete slice of NWA 5406. History: Purchased by Greg Hupé in July 2008 from a dealer in Ouarzazate, Morocco, who reported that these stones were found in the same area as NWA 4936 near Siksou Mountain in southern Morocco. Physical characteristics: Six, dark gray, mostly very fine-grained stones (total weight 281 g) with hackly fracture and lacking obvious fusion crust. The interior of each stone resembles devitrified glass with dispersed small white clasts. Petrography: (A. Irving and S. Kuehner, UWS) All specimens are composed of small mineral clasts and sparse lithic clasts in a very fine-grained matrix (which has the texture of an impact melt with heterogeneous, “swirly” glass). Mineral clasts include anorthite, olivine, pigeonite, subcalcic augite, ilmenite, troilite, and irregular-shaped grains of kamacite. Geochemistry: Pigeonite (Fs34.7Wo9.8, FeO/MnO = 59.9), augite (Fs55.8Wo26.4, FeO/MnO = 72.6), olivine (Fa25.7–27.0, FeO/MnO = 85.3–120), plagioclase (An96.2–97.2Or0.0). Bulk composition (R. Korotev, WUSL): FeO 5.8 wt%, Th 2.0 ppm, Sc 9.1 ppm, Ni 520 ppm, Sm 6.3 ppm. Classification: Achondrite (lunar, feldspathic breccia). These stones have essentially the same distinctive textures, mineral compositions and bulk composition as NWA 4936, and are almost certainly paired with the latter stones. Specimens: A total of 20.0 g of is on deposit at UWS. The main masses are held by Mr. G. M. Hupé. Korotev R. L., Irving A. J., and Bunch T. E.
(2012) Keeping Up With the Lunar Meteorites — 2012 (abstract). 43rd Lunar and Planetary Science Conference, Houston. Rochette P., Gattacceca J., Ivanov A. V., Nazarov M. A., and Bezaeva N. S.
(2010) Magnetic properties of lunar materials: Meteorites, Luna and Apollo returned samples. Earth Planet. Sci. Lett., doi:10.1016/j.epsl.2010.02.007. 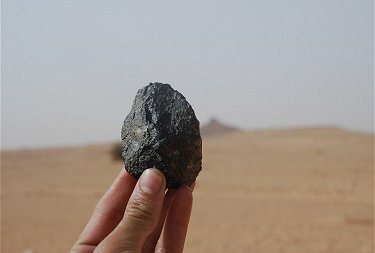 Keeping up with the Lunar Meteorites — 2009 (abstract). 40th Lunar and Planetary Science Conference, Houston. Korotev R. L, Zeigler R. A., Jolliff B. L., Irving A. J., and Bunch T. E.
(2009) Compositional and lithological diversity among brecciated lunar meteorites of intermediate iron composition. 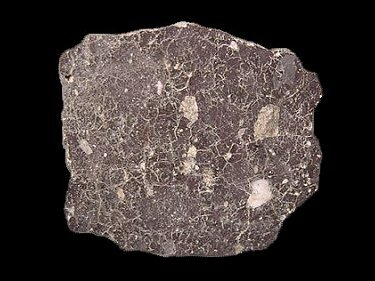 Meteoritics & Planetary Science 44, 1287-1322. (2008) Keeping up with the lunar meteorites – 2008 (abstract). 39th Lunar and Planetary Science Conference, Houston. 179.2 gram NWA 5406 individual with Siksou Mountain in background. Thin section image in Cross Polarized Light.